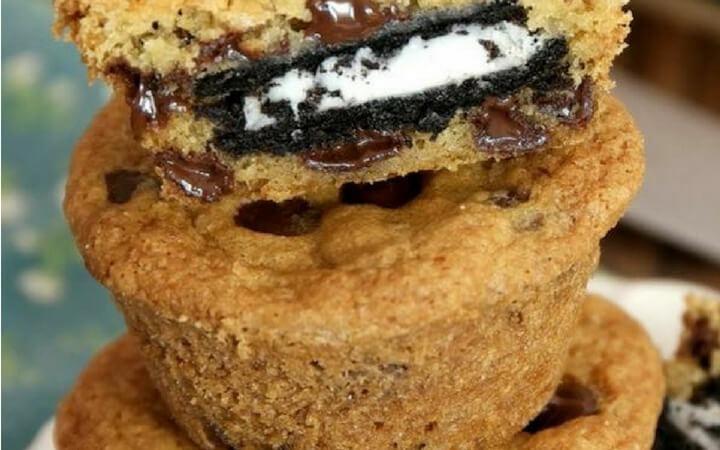 Have you ever made Oreo Cookies Stuffed Chocolate Chip Muffins? Oreo Stuffed Chocolate Chip Cookies Recipe is easy and fun to make. You know as I grew up I loved eating creme biscuits. They were my weakness. I would split them up and lick off the creme then eat the biscuits/cookies later and my mother always used to complain about the way I ate it. It was then that I thought why not to experiment with these biscuits/cookies. Oreo ad hit the market by then and my kids loved it … and me too. So I tried a few recipes. this is one of them I’m sure you’ll love it. 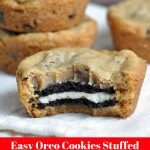 Easy Oreo Cookies Stuffed Chocolate Chip Muffins with chewy crunchy cookies and soft and moist Oreo in the middle. Perfect homemade treats that are so popular for a party. Have you ever made Oreo Cookies Stuffed Chocolate Chip Muffins? 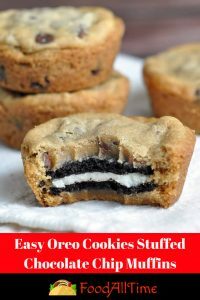 Easy Oreo Cookies Stuffed Chocolate Chip Muffins with chewy crunchy cookies and soft and moist Oreo Cookies in the middle. Perfect homemade treats that are so popular for a party. Preheat oven to 350°F. Use a nonstick muffin pan, muffin moulds or baking sheet. In a large bowl, cream butter, brown sugar, and granulated sugar together and beat in eggs and vanilla. Fold in flour, salt and baking soda. Press a half-inch layer of dough into each muffin tin cup. Add an Oreo Cookies and then another half-inch of dough on top to fully enclose. Bake for 15-18 min or until golden brown. Cool for 5 min in the pan before transferring to a cooling rack. Serve and enjoy! 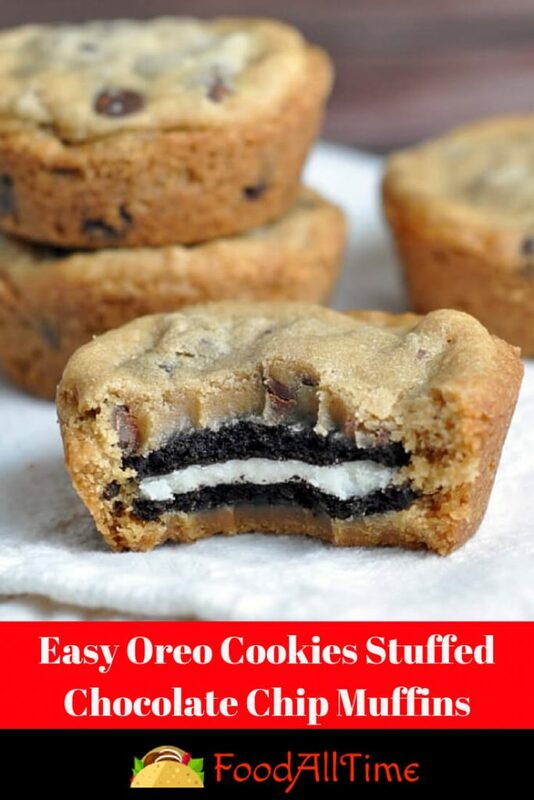 Description: Have you ever made Oreo Cookies Stuffed Chocolate Chip Muffins? Oreo Cookies Stuffed Chocolate Chip Muffins is easy and fun to make. Perfect homemade treats that are so popular for a party. Recipe Instructions: Preheat oven to 350°F. Use a nonstick muffin pan, muffin moulds or baking sheet. In a large bowl, cream butter, brown sugar, and granulated sugar together and beat in eggs and vanilla. Fold in flour, salt and baking soda. Mix thoroughly. Press a half-inch layer of dough into each muffin tin cup. Add an Oreo Cookies and then another half-inch of dough on top to fully enclose. Bake for 15-18 min or until golden brown. Cool for 5 min in the pan before transferring to a cooling rack. Serve and enjoy!